Antyodaya Anna Yojana (AAY) was started by the Central Government of India. This was introduced into the Ration cards system on 25th December 2000. Under this Antyodaya Anna Yojana (AAY) Scheme, the government will provide 35 KG of rice/wheat per month for a price of Rs. 3 and Rs. 2 to each and every family. At present, more than 1.5 Crores of Families are getting benefited under this AAY Scheme including all the BPL families or Widows also People of 60 years and above. You will learn about the Key Features of the AAY Scheme, Eligibility Criteria for AAY, Required Documents and also How to Apply for it. The main objective of the AAY Scheme is to provide food security to the people who come Below the Poverty Line (BPL). Depending on their Annual Income of the Family, they will get the Subsidized Food at their locality Itself. Giving Food to Economically Insecure Families at Subsidised Rates. Providing food about 35 KG of rice/wheat to poor families per month. Food Grains of Rs. 3 and Rs. 2 per KG will be given to the Poor. Helping the family for windows/sick people/handicapped/older people etc. Giving Benefits and Services under this Scheme. A total amount of 30 Lakhs tons of Food Grains should be kept available by the Central Government on the Yearly Basis. Once the State Government and the Central Government has finished the task of identifying all the Families who come under the Below Poverty Line (BPL), they will be issued new card under the Antyodaya Anna Yojana Scheme (AAY). The Distribution of the Food Grains will be through the every State’s Public Distribution System. These benefits and Services provided under this AAY Scheme are exclusive for the BPL families. Note: No APL Families are included under this Scheme as this is meant for only economically insecure families. Eligibility Criteria to avail the Scheme benefits of Antyodaya Anna Yojana (AAY) are listed in the form of points below. All Interested members must have their BPL Cards with them. All the Elderly, mentally, and Physically disabled people can be a part of this Scheme. Also, Widows, lactating or Single Mothers, old People of age 60 years and Above. The Tribal Families in the rural and mountain areas can also be included in this Scheme. These people can apply for this scheme when they prove that they are devoid of any other Income Sources. Also, Tribal Families must not have any other alternative Sources of income to avail the benefits and Services of the Antyodaya Anna Yojana(AAY) Scheme. These factors majorly allowance the Survey Department to identify whether a Family belongs to an Antyodaya Anna Yojana (AAY) Category or not. As we all know that the Ration cards are classified into different categories and each category is given a Colour such as Yellow Colour Ration card for BPL families and Pink Colour Ration card for APL Families. The identified families for this AAY Scheme will be provided with the Colour Ration card. 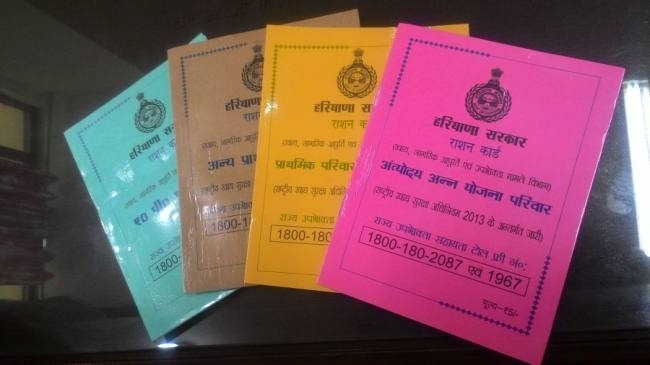 They Replace the Old BPL Ration cards with these AAY – Antyodaya Anna Yojana. This Colour Ration Card will be different from the Normal Ration Pass. In Some States, the Colour of the AAY Ration card will be Green in Colour. The colours will be given as per the Guidelines of the Antyodaya Anna Yojana (AAY) Scheme. All the interested candidates and Enlisted candidates have to submit Some of the certificates to get the Antyodaya Anna Yojana (AAY). These certificates are listed below as per given guidelines of the Government and Food Department. Identity Proof such as Aadhaar Card, Driving License, Electricity Bill or any Telephone Bill. Below Poverty Line (BPL) Certificate. A Photocopy of the Bank Passbook. Income Certificate of the employees or workers in the Family. Note: The Telephone Bill or the Electricity Bill submitted should not be older than 3 months other wise it will not be accepted as an Identity Proof Certificate. Any Indian Citizen living in Rural areas has to apply for Antyodaya Anna Yojana(AAY) from a Panchayat head. He/She has to provide the Income Certificate to the panchayat to let him/her know about the financial status of the Applicant’s family. Then the Grama Sabha will decide whether the applicant is eligible for Antyodaya Anna Yojana (AAY) or not. After selection of families, the list will be approved by the Department of the Rural Development. For Citizens living in the area must apply in their municipal corporation. The above table is the list of the State-wise number of the Antyodaya Anna Yojana (AAY) Families and families identified and Ration cards issued under the Antyodaya Anna Yojana (AAY) by the State’s Governments/UTs. This Antyodaya Anna Yojana (AAY) Scheme is still run by the Central Government which was also taken care by the Ministry of Food and Safety.